Since its birth, IPTV technology quickly gained acceptance among small to midsize service providers who were the first to capitalize on its benefits. For such providers, IPTV technology offers a cost effective method to deliver niche content to end-users utilizing existing broadband infrastructure. While large Cable operators and ISP providers were not among the early adopters of that technology, nowadays many of them have realized its benefits and are looking to deploy it. IPTV technology benefits Cable operators and ISP providers by enabling them to expand their content offerings, roll out new niche offerings and fend off competitive threats. A major concern for Cable operators and ISP providers with regard to IPTV technology is how they can deploy it with minimum changes to existing infrastructure. Fortunately, IPTV technology is agnostic with regard to the underlying infrastructure as long as it meets certain bandwidth requirements. Depending on utilized compression technology and desired picture quality and size, IPTV technology requires from as low as 700Kbps to over 10 Gbps bandwidth per channel which allows it to be deployed in both Internet and closed network environments. 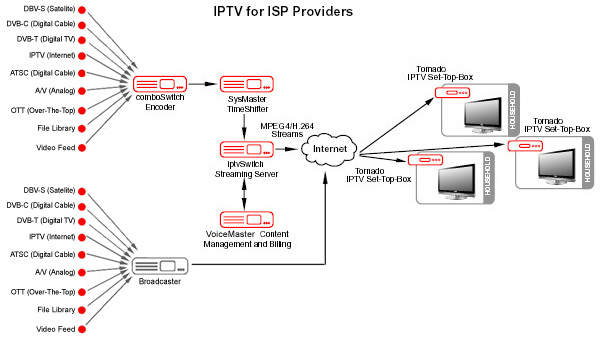 In IPTV deployments in closed network infrastructure, providers can utilize a small number of SysMaster Broadcasters to capture DVB signals from satellite, cable or terrestrial systems and convert them to IP signal. Typically, the DVB signal comes in MPEG2 format with standard content encryption. The Broadcaster captures the encrypted signal, decrypts it via a hardware decryption card, and converts it, without transcoding, to IP Transport Stream (TS) signal. The IP TS signal is then distributed via Multicast in a closed network infrastructure, processed by IGMP switches/routers and sent to the Set-Top-Boxes (STB) of end-users utilizing IGMP multicast subscription mechanism. In such implementations, the end-users’ STBs (e.g. Tornado M55) should support MPEG2/TS streaming and the IGMP protocol. Because in such setup the incoming video signal is not transcoded, the Broadcaster can support up to 30 channels which reduces the overall deployment cost. Typical applications utilizing closed network infrastructure include IPTV over fiber optic local loop, IPTV over cable and IPTV for Hotels. SysMaster Broadcaster, a robust and multi-functional digital video gateway designed to capture DVB-C/S/T streams and convert them to IP TS signal. iptvStreaming Server, an universal TV, video, audio and content streaming server which delivers audio/video content to multiple Tornado M55 devices using TCP or UDP streaming. Tornado M55 IPTV Set-Top-Box, an advanced customer premises equipment device supporting MPEG4 and H.264 video compression.